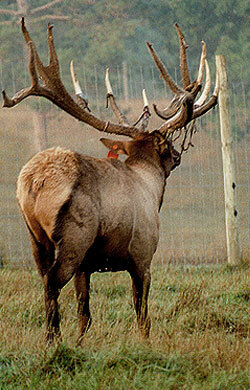 Stoney Hills Elk Farm has been raising trophy elk for over 14 years. We are located on 425 acres of private property near the Brainerd Lakes Area of Minnesota . We are surrounded (literally) by over 3000 acres of Minnesota Nature Conservancy and DNR Scientific and Natural Area, making it a great place for trophy whitetail hunting. Lake Alexander is located less than 1⁄4 a mile away, Fishtrap Lake and Shaminueau are only a few minutes drive. Most important this remote area is an excellent location for Hunting trophy elk and monster whitetails! Feel free to browse through our elk bulls available for this year and bulls from previous years. with any questions or to reserve a hunting location for this Fall!